Home > Who’s afraid of Steve Bannon? Steve Bannon would have you believe that he stands at the crossroads of history, directing traffic. Ever since he emerged as a national political figure in the latter stages of Donald Trump’s presidential campaign, the Breitbart.com chairman has cultivated a reputation as a wily tactician, the leader of a nascent nationalist revolution, and a visionary whose dreams of a new political order are just beginning to come to fruition. 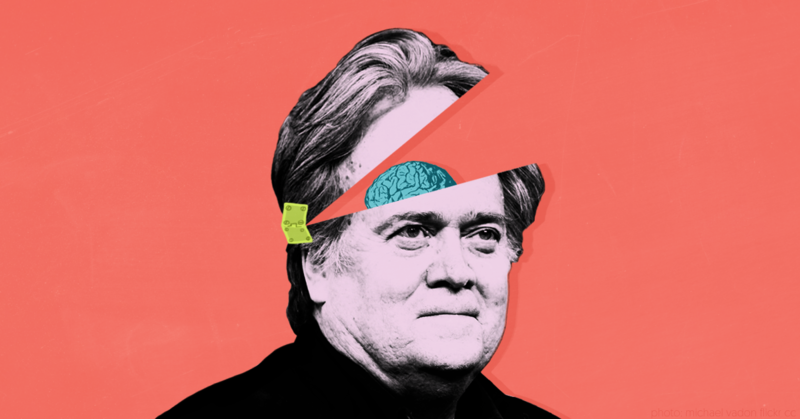 During his brief tenure as chief adviser to President Trump, his various power grabs  and heavy-handed policy maneuvers  led to the perception that “President Bannon ” was the real power in the White House. This theoretical Steve Bannon is constantly luring his unwitting enemies into traps  and is always winning even when it looks like he’s losing . He is Rasputin, Machiavelli, and Doctor Doom all in one rumpled package. The damage-control operation kicked into gear even before news of Moore’s alleged misconduct was first reported by The Washington Post. After the Post approached the Moore campaign asking for comment, the campaign fed the scoop to Breitbart reporter Aaron Klein. Klein obligingly published a piece  that ran interference on behalf of Moore, framing everything around his denials and casting the Post as an untrustworthy and biased villain. The pre-emptive knockout didn’t work , so Bannon took more aggressive measures. He dispatched Klein and Breitbart Washington Political Editor Matt Boyle to Alabama to, in the words  of Axios’ Jonathan Swan, “discredit the Washington Post's reporting on Roy Moore's alleged sexual misconduct with teenagers.” This escalation produced similarly disappointing results: Klein ended up filing an “exclusive ” that claimed to undermine the Post’s reporting but accidentally confirmed it , while Boyle spent his time counting the number of applause breaks  during a Moore speech. While Bannon’s crack  journalists  were bumbling around Birmingham, he got busy trying to spin up a protective narrative around Moore. But without any exculpatory evidence to lean on and with mounting proof of Moore’s guilt, Bannon could go in only one direction: a far-reaching anti-Moore conspiracy. As Moore’s political standing deteriorated and national-level Republicans began distancing themselves from his campaign, Bannon started arguing that the conspiracy ran deeper than anyone could possibly imagine. “You’re going to find out that what happened down there was Republican operatives had this information or were concocting some of this information, working with the Washington Post, who is lying about this,” Bannon said  on Breitbart News Daily. He also identified the unlikely mastermind behind it all. “This is just another desperate attempt by Mitch McConnell to keep power,” Bannon said of the Senate majority leader, “and it’s not going to work.” It might seem counterintuitive that the leader of the Republican Senate majority would sabotage his own party’s nominee and reduce his party’s majority as a means of retaining power, but, then again, most of us can’t see around corners like Bannon can. The reason Bannon and Breitbart.com rode to Moore’s rescue is that Bannon -- who, again, glides along on his reputation for political vision -- put Moore in the vanguard of his “economic nationalist” movement. Bannon broke with Trump to endorse Moore, and he was the headline speaker  at Moore’s rally the evening before the September 26 primary runoff election. “Tomorrow is going to decide who has sovereignty in the United States of America,” Bannon told the crowd in characteristically grandiose fashion. Anyone with an ounce of prudence would have been extremely wary of so tightly aligning himself with Moore, whose political career prior to the sexual assault reports was defined by extremism and controversy . But Bannon doesn’t do caution. He’s leading a movement that deliberately stokes racial resentments, places national identity above all other concerns, and actively rejects multiculturalism. Such a movement can’t help but attract kooks, racists, and extremists. It’s Bannon’s job to make them respectable and, if possible, elect them to high office. Bannon’s gamble on Moore blew up spectacularly, as anyone with even a passing familiarity with Moore’s background could have told you it very likely would. It’s become so damaging that, as The Daily Beast reports , Bannon and his lackeys are belatedly second-guessing their continued support for Moore as the accusations against him have mounted. According to the outlet’s sources, Bannon said, “I will put him in a grave myself” if it turns out Moore lied about committing sexual assault.